On a Sunday I decided to get out early and try the official bike roads as shown on the Randwick Council maps. My trail was to cover the paths between Centennial Park, NSW University, Heffron Park, and Kingsford. I began in Bundock St and did a figure 8 for a total distance of 18km. I did the journey on my mtb eBike, I feel better on roads with an eBike with wide tires and suspension..
Houston Rd – The best of the car bike roads. Quite wide and you can give the car doors a good metre with no drama. Doncaster Avenue – Apart from a few pictures of bikes, this is a poor road for cycling, Its narrow, busy and has car door hazards Its very popular with cyclists despite these issues. 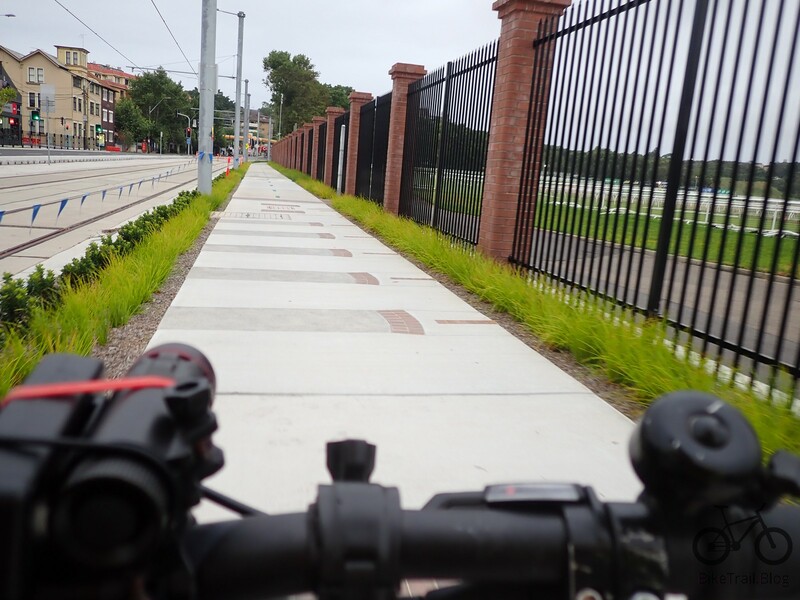 NSW Uni to Heffron Park – a pretty average collection of unsignposted streets that run in a reasonably straight line through to Heffron Park. The traffic on the roads is bearable except near the Hospital where it is very busy. Its your alternative to Anzac Parade or Banks Avenue. Pictured is Byrd Avenue that provides some respite from traffic. Try it, you may like it. Banks Avenue – A very popular cycling street that is not without its hazards and popular with cars. Thats my figure 8 look at Randwick Rds. They will be going onto my maps with the exception of the great tram line section as Black Bike Paths. In otherwords, take it easy if you need to use them and always watch for cars. Note: Lets get this out there, I do not really enjoy riding on roads, I think bike accidents are not individual events, they are a statistical occurrence. So I like to lower my risk by trying to ride somewhere where I will not run into a car door and a car will not accidentally run into me.